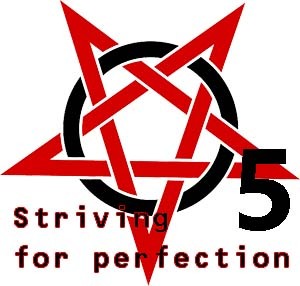 Number 5 is generally considered to be a number of the pentagram, symbolizing five ends striving for perfection. It is a good sign. People under number 5 impact are guided to the unknown. Despite the best promises and expectations people should remember that unknown rarely brings positive outcome. Number 5 is always in need for motion, this number is dynamic and changing, and it often leads to misunderstanding in the life of a person. The one with number 5 should always be in control of his or her desires. In such case this number will bring financial success, as it was foretold by Pythagoreans. People with birthday number 5 are very sociable, have a flexible mind and wide outlook. However, often their strange and sarcastic sense of humor makes others uncomfortable and it spoils total impression about such person. People number 5 are very curious, they love new trends, researches, tendencies, rumors and news of different kind. They tend to read everything a lot. Such people need to organize knowledge they gain in order not to confuse facts with what they've heard somewhere. They accumulate information, it is sort of energy for them. It has some flaws, because they also know tons of unneeded information that surfaces when person wants to remember something else. Number 5 is a symbol of a person with principles, bright individuality and lack of organization, it can be seen by the state of their desktop. Depending on whether partners share the same moral values or not, what level of understanding and love is in the couple - relationships may be either complicated or comfortable. People should spiritually match each other. Number 5 people don't like when the feelings are a sort of drama or shown outwards. People like this put a lot of sense to the words. Words have more power than physical manifestations of love or any other efforts. However, if such a person says that he or she loves you, it is sincere and well-thought phrase. It is often complicated for such people to say how they feel, to find the right words, so they are often told to be insensitive. But it isn't true, number 5 is really touchy and it hurts to hear such words. Time will pass by when such people can finally prefer efforts and actions over words. Number 5 people try to control their emotions, so if they feel like it's too much for today they won't continue arguing or celebrating, because they value a harmony. If people with number 5 are parents - they are usually happy parents, as they love kids. They are for harmony in everything, their sexual and emotional life is balanced and children can grow in a positive atmosphere. They readily express their love to children. However, they won't likely spoil their child because the key for them is harmony. They know where the line is and why they can't cross it. They truly believe that only fair work and independent efforts can lead to a person-making and success in any sphere. Number 5 obtains oratorical skills and outstanding mind abilities, they know when and where to use it. Freedom of thought is really appreciated by people with birthday number 5.